October 31, 2018 Robert W.
Step and repeat banner printing makes for a large impression on clients when they see large backdrop banners with names and logos alternately printed on a fabric banner or vinyl banner. These step and repeat banners are very popular at shows and events like the television award ceremonies or the Academy Awards. The theory being that if stars or important people get their picture taken against these background banners, the names or the sponsors or logos can be seen in the background. Step and repeat banner printing is also needed for events and trade shows in the Las Vegas area. Hundreds of events and shows take place in Las Vegas yearly and many of these shows need large background banners as part of the event. These step and repeat banners are used in the background of vendors booths to help identify the company sponsoring the booth and/or their product lines. They act as a visual reinforcement for the clients while browsing or talking with company representatives. In fact, the concept of step and repeat banners is being used at night clubs and shows where people can have their pictures taken against them as a souvenir. Step and repeat banner printing is not expensive and is very cost effective. 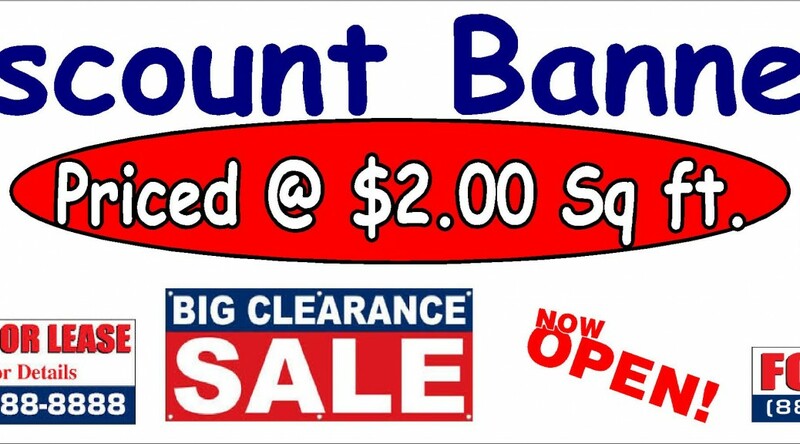 The cost of large format printing on a vinyl banner material is about $2.00 a square foot and the price for fabric prints is about $3.00 a square foot. While the vinyl material is tougher and last longer, it is subject to wrinkling if not cared for properly. The fabric material print look nicer but is more fragile because it is made out of polyester but is wrinkle free. Contact a local sign company in Las Vegas if you are looking for a step and repeat background banner. They most certainly will impress your clients. Fast large format sign printing in Las Vegas can get you that badly needed sign printed and made the same day. Large format printers have improved dramatically over the last several years and are now capable of printing several hundred feet of print per hour. The large format printers named Mimaki, Epson, Mutoh and others are in the sign store printers arsenal. These modern printers utilize an array of inks to make dazzling colors and vivid prints. In addition, many of the Las Vegas strip casinos and hotels offer large convention venues as well that exceed 100,000 square feet of space that is dividable and can hold multiple shows and events at the same time. The reason the sign stores are located close is to cut down on travel time and make it easy on businesses to locate the sign shops and get their products. Fast large format sign printing does not mean that it is going to be expensive as most of the work of making the sign is completed by these wonderful large format printers that take much of the work out of making a sign. October 30, 2018 Robert W.
Same Day Banner Stand Signs are necessary when there has been unforeseen circumstances and your banners stands signs have been damaged or lost and need replacing fast. This actually happens quite frequently in Las Vegas because of the numerous trade shows and conventions held here annually. Literally thousands of vendors come to Las Vegas every year to display their goods and services and bring the newest innovations and gadgets. Unfortunately, it is all too common that their marketing material sometimes does not arrive or arrives damaged. Same day banner stand signs is a great term to find a sign store in Las Vegas that can print and make your banner stand in a single day, often within a few hours of contacting them. Las Vegas is full of sign stores competing for your business ands many of these stores offer same day printing. Depending on the busy schedules, there may be a small fee attached to making your banner stand sign above the normal charge because of scheduling issues, overtime, etc. Same day banner stand signs come in a variety of sizes to match to your marketing display needs. These banner stand signs come in as wide as 5feet and as small as 2 feet wide. All these banner stands have an adjustable pole to allow the graphics to be set up to that perfect height without the need of a bleed ( which is required on the inferior tent pole type banner stand system). These stands all come with a carrying case to make transporting them very easy and best of all, it only takes a person a minute or two to set up the banner stands and take them down. They are reusable. Contact a local sign store in Las Vegas and see how same day banner stand signs can help your display at the trade shows and convention venues. October 28, 2018 Robert W.
Exhibit pop up displays in Vegas are increasing in popularity as the prices have gone down. 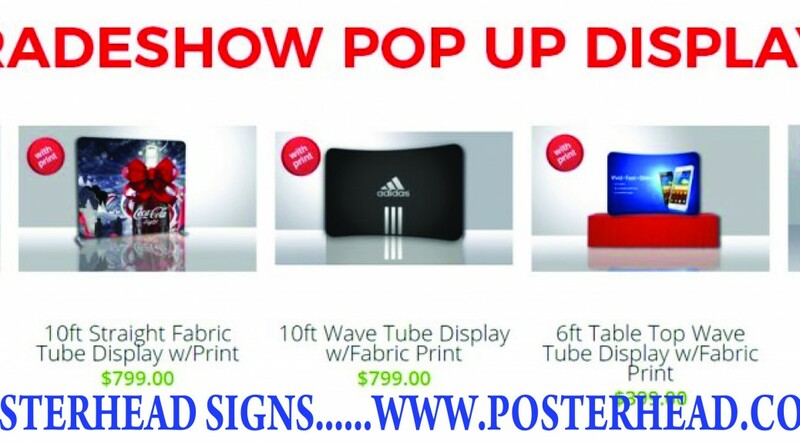 These fabric pop up displays are getting cheaper as more manufacturer are entering the market. Currently, you can buy a 10ft. curved for around $500 at places like www.Posterhead.com . Exhibit pop up displays make wonderful backgrounds for events and exhibits as they are large and can contain a lot of product or service information about your company. In addition, because they are fabric and non shiny, you can have pictures taken against them as well. These popular and inexpensive exhibit pop up displays have a turnaround time of about 5 days. Exhibit pop up displays come in many \sizes to accommodate the size that you need. These pop up displays are printed on a polyester fabric material in full color, meaning you can have as many colors on them as you like along with pictures and logos. The fabric material is then stretched over a structure to make it wrinkle free. The whole set up comes with a carrying case to make it easy to move about and can be set up with only one person in a short amount of time. This is advantageous because it can be set up without the use of union labor, which can be very expensive and time consuming. The unions that work the event centers like Mandalay Bay Convention Center, Las Vegas Convention Center and Sands Expo have strict rules regarding weight, size and set up of graphic displays. Its a complicated process but by being able to walk in with your graphics, you will save time and money. Contact a local sign store about how these pop up displays can improve your display booth. By adding a table or a couple of banner stands, you pretty much have a very portable display. October 27, 2018 Robert W.
Metal no trespassing signs in Las Vegas are used for posting on premises to warn vagrants and other people that it is private property and they should not be on your property. While you can but temporary No Trespass signs made of plastic and write the Nevada Revised Statue on the plastic and post it, these plastic never hold up and are easily taken down to defeat the purpose of putting them off. In addition, the plastic no trespass sign will quickly fade in the direct sunlight in Las Vegas that often gets to over 100 degrees. Metal no trespass signs are the way to go for long term usage and visibility. Metal no trespass signs are made with aluminum versus steel or other types of metal so that they do not rust when exposed to the weather elements. Aluminum does not rust and when a vinyl application is placed on the aluminum substrate, it is laminated for uv protection. The aluminum no trespassing signs can then be screwed or bolted into a structure so there is no chance it can be pulled down by a vagrant or trespasser. 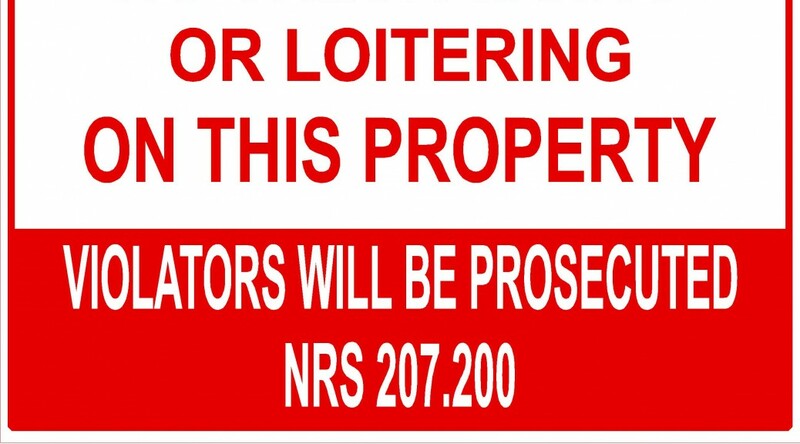 Metal no trespass signs are great for helping you against liability for any type of injury that occurs on your vacant property. it also established notice against vagrants who camp out on properties and then legally argue in court that they have rental rights because there were no signs posted prohibiting coming on to the property. Metal no trespass signs are cheap insurance and protection against unwanted guests coming on to your property and doing damage or causing mischief. These signs can be made to any size you like, but the 12″ wide by 18″ tall design seems to be the most popular along with the 18″ tall x 24″ wide design being a close second. October 26, 2018 Robert W.
Trade show sign printer keeps busy during the trade show and convention season in Las Vegas. Millions of people come to Las Vegas annually for the conventions and events that draw the biggest companies in the world. The largest and best conventions & trade shows come yearly to Las Vegas like the Consumer Electronic Show ( CES ) , CEMEX and many others. These large trade shows require large convention venues like the Las Vegas Convention Center, Mandalay Bay Convention Center and Sands Expo that have millions of square feet of floor space to hold the largest events. Trade show sign printer can print those vinyl banners needed for the back of display booths or print banners large enough to hang from the rafters of the convention center. Trade show sign printer can print those banner stands , pop up banners and other compact signage as well as coroplast signs and vinyl signs for your display needs. The key to trade show sign printing is the ability to be able to produce signs in a hurry. Very often a company will come into Las Vegas with the intention of setting up at one of the event centers and find themselves with damaged or lost graphics ( and just simply forgotten graphics back home). In cases like these, no matter who or what is a t fault, the sign graphics need to be replaced in a hurry. Trade Show vendors need a speedy sign shop that can print those signs and banners in a hurry. Fortunately, most sign stores that service the trade shows and conventions have high speed large format printers capable of printing several hundred square feet of signage an hour. Simple vinyl banners and banner stands can be replaced in an hour or two and more complex signage a little longer. Contact a local sign store today if you find yourself in need of a tradeshow printer. October 25, 2018 Robert W.
Trade show pull up banners are one of the most popular display signs at a trade show. Trade show pull up banners are very easy to set up and can be placed anywhere in your booth and stand alone. Their compact size makes them sound small. but they enlarge quite big. Take for example the standard 33″ x 78″ banner stand, that equates to over 17 feet of printable space for your marketing message. Placing a couple of these trade show pull up banners next to each, you can simulate one large graphic as well. This set up is a called a banner stand wall and vendors / companies will take a large graphic and cut it into smaller graphics and placed on banner stands and when placed net to each other, the graphic appears to just be one large display graphic. Trade show pull up banners come in different sizes to match your needs. The most popular size is the 33″ x 78″ pull up banner stand but they basically come in sizes ranging from about 2 feet wide to about 5 feet wide. They also come in different heights and in premium chrome base models as well. All of these stands come with an adjustable pole that allows for height adjustment of the banner stand as well as a carrying case to make it easy to move them around. Trade show pull up banners can be made in one day when necessary, which is important for people attending the trade shows because graphics sometimes get damaged or lost and need replacing in a hurry. Local sign stores in Las Vegas can assist you in getting your replacement retractable banner stands in a hurry because they specialize in helping companies at the trade shows and conventions with their signage needs. These sign stores are usually located within a few minutes of the trade show venues. 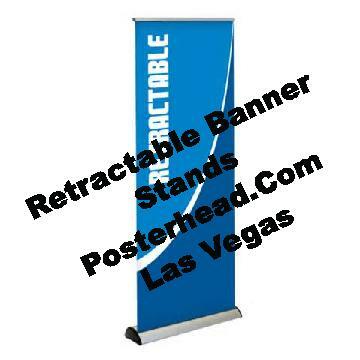 October 24, 2018 Robert W.
Same day rush banner stands are needed quite frequently at the trade shows and conventions held locally in Las Vegas. Events and shows are happening daily in Las Vegas and many signs and banners are needed for these shows. One of the most popular display graphics at these events and shows is the retractable banner stand. These compact display graphics when set up are very large and contain a lot of information. In addition, the retractable banner stand can stand alone and pull straight up which allows them to be placed anywhere in your booth that you want. 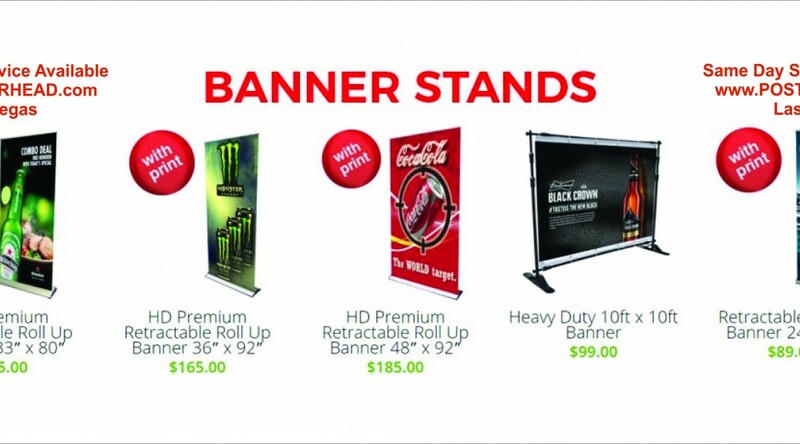 The most common size banner stand, the 33″ x 78″ http://posterhead.com/banners/banner-stands/retractable-roll-up-banner-33-x-78/ allows for over 17 square feet of print to be on the graphic. This 17 feet can be just color, text , pictures or logos as it is full color. Same day rush banner stands are needed by many vendors because at the set up of company booths at these events, many signs and banners are found to be damaged or lost and often just plain old forgotten back home and need to be replaced for the show. Since the need for the signage is discovered at the last minute, vendors need to have their graphics replaced within a few hours so that the show can go on. Fortunately, there are sign stores that service the trade shows and conventions that have the capacity and ability to print and make signs in a hurry. Same day rush banner stands come in many different sizes to match the needs of vendors displaying their goods and services at the many events in Las Vegas. These banner stands range from just a few feet side all the way up to about 5 feet side and come with a carrying case to make for easy set up. Contact a sign store today if you find yourself in need of last minute graphics. October 23, 2018 Robert W.
Custom plastic coroplast signs in Las Vegas are perfect for temporary signs. Custom plastic coroplast signs are great for events, shows, political signage and many other temporary uses where quick, weatherproof signs are needed. These custom plastic coroplast signs can be made quickly and cheaply. Custom Plastic coroplast signs are made with 4mm coroplast that is widely known as the material they use political signs out of. You see these signs near political election times outside and they are generally used for a period of 3 to 4 months before the weather starts to deteriorate them. This weathering is especially true in Las Vegas where summertime temperatures reach well over 100 degrees for long period of times. You also see them used quite frequently as ” Bandit or Guerilla Signs” where carpet cleaners and psychics use them as signs and post them all over the city on telephone poles and fences and advertise their services. They use these signs because they are cheap and highly effective. 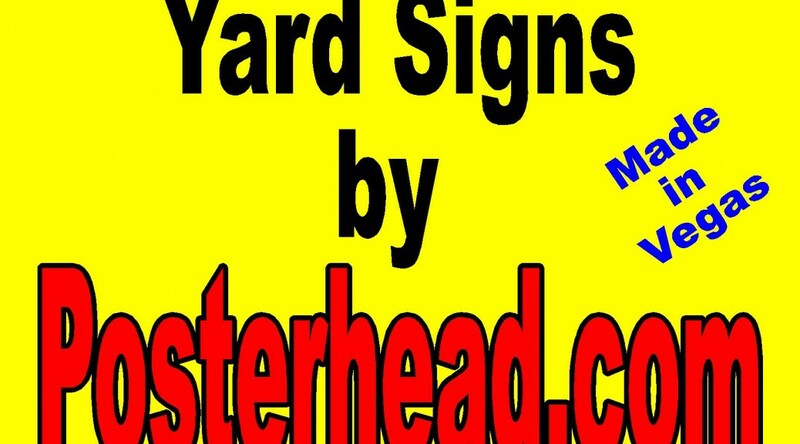 In fact, realtors use these sign for house listings and then simply throw away the signs after the house is sold rather than go through the expense of having permanent aluminum signs made. Custom plastic coroplast signs are generally used outdoors because they have ridges on them and are not smooth in appearance. They weather well in rain and heat, unlike foam board signs that are smooth and used for indoor use only ( the foam board warps in weather and is not weatherproof ) However, for trade shows and conventions, many vendors will use coroplast signs for display purposes because of their pricing and then simply discard them after the show. Custom plastic coroplast signs can be purchased and made locally in the Las Vegas area at sign stores. Contact a sign store today and see how these plastic signs can help you. October 22, 2018 Robert W.
Banner pop up are banner stands that retract the graphic display into the stand . These retractable banner stands are very popular at trade shows and conventions in the Las Vegas area. Banner pop up stands can be placed in a variety of places because they are self standing graphic displays that offer a large visible graphic that impresses clients. The standard of the sign industry for banner stands is the 33 inch wide by 78 inch tall version that actually contains more than 17 square feet of printable space. which makes for a very impressive display at a low cost. Millions of people are come to Las Vegas annually for the trade shows and conventions. Thousands of vendors come annually to display their wares and services at these events and need thousands of display graphics to help market their companies products and services. Banner pop up come in many different sizes to accommodate your needs. Banner pop up range from about 2 feet wide all the way up to around 5 feet wide. All these banner pop up come with a convenient carrying case to make it easy to transport them event to event. The graphics are full color and can have pictures as well as logos printed on them. The stands themselves can be purchased in standard or deluxe form with chrome bases that are very impressive. Banner pop up can be made the same day in cases of emergency. Sign stores in Las Vegas are aware that many times display graphics get lost or damaged when being shipped to Las Vegas and these graphics need to be replaced quickly and inexpensively so that the show can go on as planned. Nothing is more frustrating than to have missing or damaged signs and banners for you show when you have planned so carefully for your event.